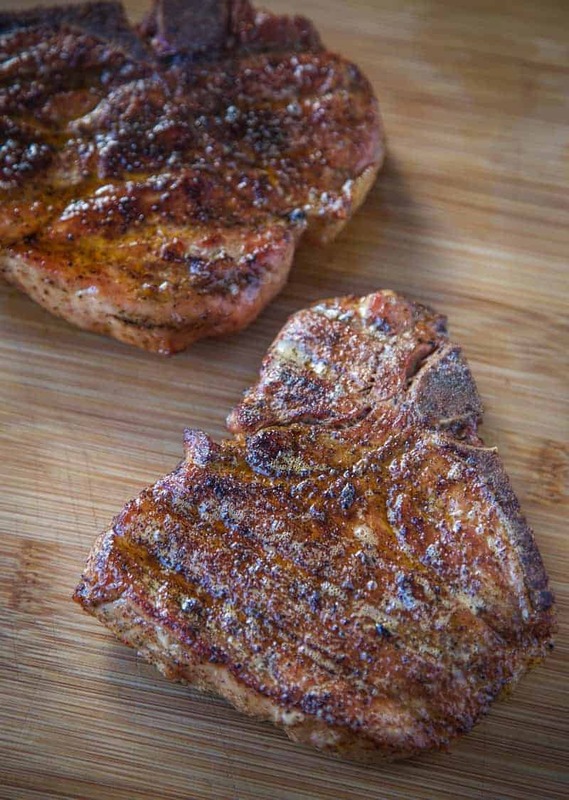 These reverse seared pork chops are smoked first for that awesome flavor, and then finished hot and fast medium rare for a perfectly cooked pork chop. These ain’t your mama’s pork chops! Sometimes when I hear people turn their noses at the idea of pork chops, I can’t help but ask them why they dislike such an amazing cut of meat. 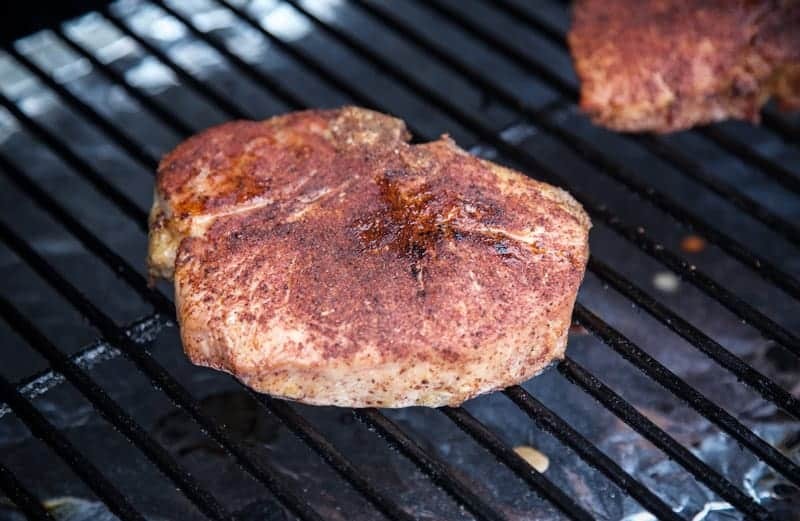 Without fail, I hear the classic story of growing up and family overcooking pork chops almost like a hockey puck (that’s the kind of pork chops I grew up with anyways… SHHHH DON’T TELL MY MOM!). So when that happens, I try to turn on my charm and convince them to rethink the classic pork chop oven bake, and try it out on a grill or smoker. Pork chops have a bad rap, and I’m fully dedicated to bringing back the love for the pork chop. And when cooked right with a reverse sear (not overcooked), and paired with a good wine, you’ve got yourself (dare I say) a fancy meal worthy of date night! Like I said, these ain’t your mama’s pork chops! 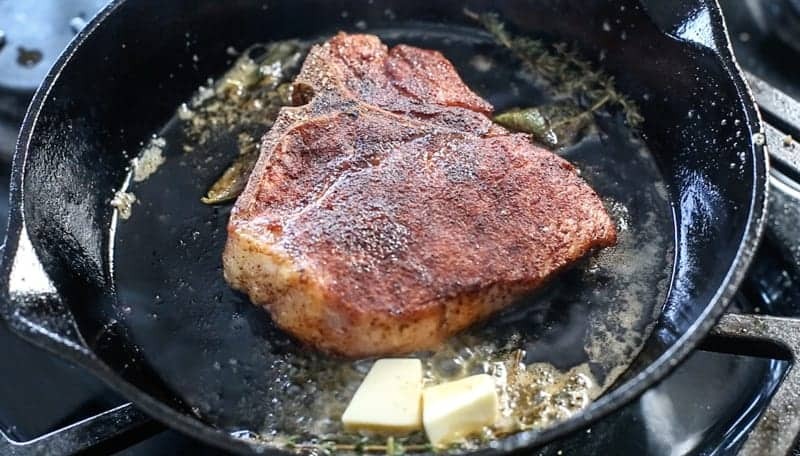 For this we’re doing the reverse sear method to make sure you get that gorgeous slow smoke infusion, then finish on the grill, or in this case, a hot cast iron pan, for that great sear and char. 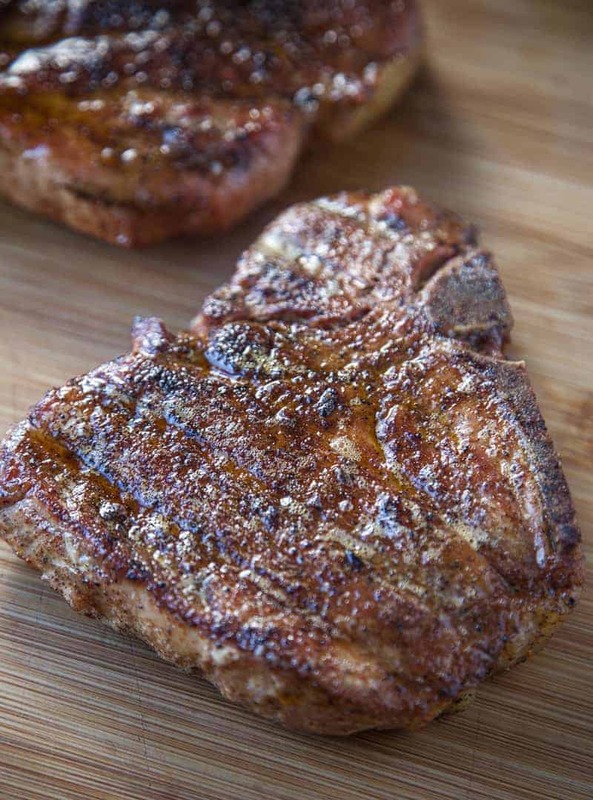 The pork chop is a loin cut of the pig, essentially it is the t-bone steak of pork. You can get them bone in or boneless. I love bone in for flavor and presentation and I like the butcher to cut me a thick piece, like 1 ½ to 2 inches thick. It is relatively lean unlike its beef cousin, but you will still want to look for good marbling. This is really low maintenance. 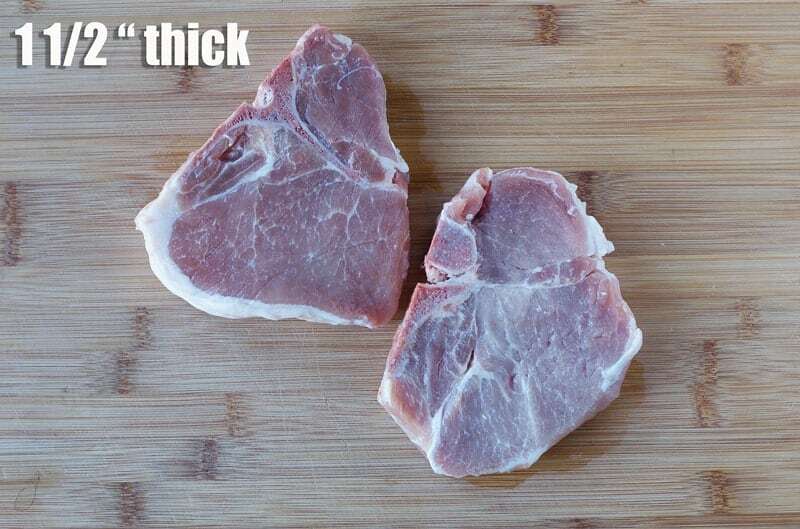 You may want to trim excess fat on edge of meat if there is any. You can always go salt and pepper. We like our basic rub recipe for pork. It is what it was made for. It has a little sugar, a little savory and a little spice. We are going to reverse sear to lock in a little bark with the rub, then finish in a cast iron pan with a butter bath or baste as some call it. Place it on your smoker at 225 degrees (F) until the internal temperature of the meat is 135 (F), then remove. You can finish it on a hot grill, but for added flavor we finish it on a hot cast iron pan until our desired temperature of 145 degrees (F). Throw into the butter your favorite herbs or ingredients and spoon it over the top for extra flavor. You guys! Try this and tell me you don’t love pork chops! 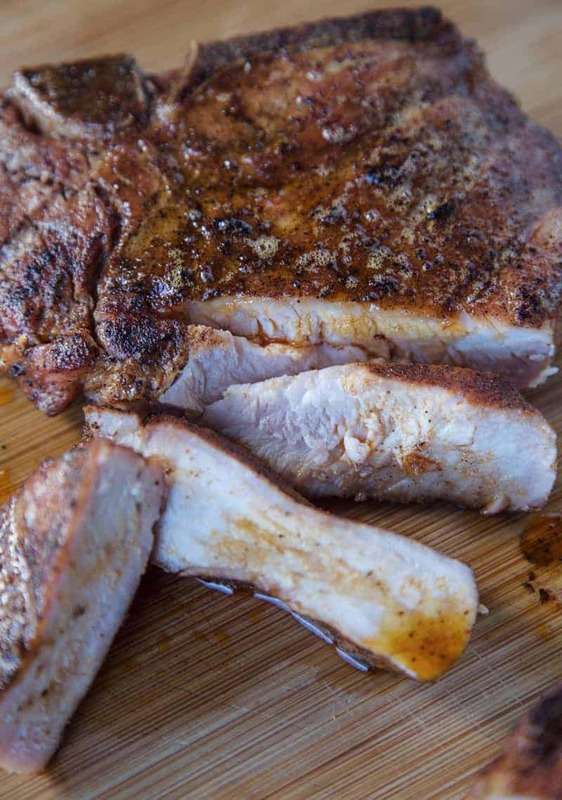 Jazz up boring old pork chops by reverse searing them. Slowly smoke them for an hour then finish on a hot grill for amazing flavor. Preheat smoker to 200 – 225 degrees (F) using oak or apple wood. Coat pork chops with olive oil and liberally apply the dry rub. Place the pork chop on the smoker and cook until internal temperature is 135 degrees (F) and then remove (they will be on about 45 minutes - 1 hour). When your temperature gets close to 135 degrees (F), preheat large cast iron skillet on stove top. Place pork chops into the skillet and add the butter and fresh herbs. Butter will melt quickly, be sure to quickly start basting the pork chops with the melted butter in the pan and then flip after 2 minutes and repeat the basting for 2 more minutes. Remove pork chops from pan and let rest for 10 minutes tented with aluminum foil to let the juices redistribute. Cut and serve with your favorite sauce, we used the brown butter sauce from the pan. Pork works great with so many red wines (Pinot Noir comes to mind). But it also works great with white wines, especially barrel aged white wines like Chardonnay. Not only does the butteriness and creaminess of a barrel aged Chardonnay a fantastic match for the pan sauce we created, but the oak notes are also a nice match for the sweet apple wood we used in smoking the meat. What about you? What are your thoughts on pork chops? Do you love ’em? Hate ’em? Find them indifferent? WOW, I’m really into this! And it only takes over an hour to make, so I’m considering it for the next meal. Haha, I hear you on trying to change people’s minds about food they associate with growing up. I do the same for the poor, misunderstood green bean – one of my favorite vegetables too many people think have to be from the can. Yuck! I like that you have the idea of white wine as well when so many people only think red wine with meat. Looks delicious! This sounds great! 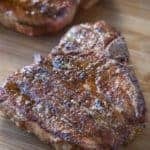 I have tried several pork chop recipes which have refreshed my perspective on them. I’ll have to try this one too! These look incredible! My mom always made the best pork chops, so they hold a special place in my heart 🙂 No need to convince me! What if I don’t have a smoker? Judy, you can reverse sear without a smoker. Or if you have a gas grill, use wood chips in a foil pouch for the smoke period. Otherwise I would consider the more traditional method of high heat sear, then put into the oven until your desired doneness. You can also reverse sear by putting the pork chops on a wire rack in the over at 225 or 250 until 10 degrees below your desired level of doneness. Then sear them in the cast iron pan. Get yourself a pellet grill/smoker. As easy to use and maintain as gas, and can hold temperature from 220F up to 500F. I’m enjoying my Camp Chef grill (great features, cheap), but people love their other brands too. Uhm “reverse sear” means cooking it to temp first and THEN searing the outside. You’ve got your steps backwards. Weird. Youre right the steps definitely say that now, guess I misread it the first time. I have been cooking chops and chicken breasts this way for years. It is by far the best way I’ve found. The only thing that I do a bit different is I will marinate the meat from 3 to 24 hours in a dark brown sugar and apple cider or balsamic vinegar rub, with my favorite spices. Then before cooking I dry, add oil and pack meat with brown sugar and spice rub, pack thick! Chicken out around 150, then fry. Awesome! That sounds amazing!!! Especially the fry part, the texture plus that marinate base seems like it would be a great combination. This was my first try with my smoker . It was the best ever! Cut the salt to 1 tbsp based on comments and it was perfect! Tom thanks so much for taking the time to drop a comment!! Love the feedback and glad it came out, especially for breaking in the smoker!!! What kind of smoker did you cook it on?